Get the latest firmware for the E-M1 Mark II, PEN-F, and E-M5 Mark II to add exciting new features! It’s stunning. PEN-F features all-metal construction with luxurious metal and leather-grained accents. The magnesium top cover has no visible screws, while the back of the articulating monitor is finished with a premium textured grain. Finely-crafted controls are positioned at your fingertips: an exposure compensation dial on top and two customizable dials to assign aperture, shutter speed, ISO, and white balance. They’re all operable with without taking your eye from the bright OLED viewfinder. The 3.0” monitor doubles as an AF Targeting Pad - touch it with your thumb to set focus points while composing your shot. Add unique accessories like genuine leather straps, a body jacket or the customized metal grip to compliment your shooting and personal style. CREATE THE PHOTOS YOU ENVISION. You love photography that’s distinctive and film-like. PEN-F’s Creative Dial creates the rich textures of film without all the post work. Just set, compose and shoot. Spin the front-mounted dial to easily switch between four main functions: Monochrome Profile Control, Color Profile Control, Art Filters, and Color Creator. Use the Profile Control options to precisely set the saturation of twelve individual colors, curves, shading, and monochrome film grain effect. Create and save your own profiles. Or select one of the PEN-F’s presets, including Chrome Film Rich Color, Chrome Film Vivid Saturation, Classic Film Monochrome, and Classic Film Infrared. POWER AND SPEED TO CAPTURE EVERY DETAIL. PEN-F’s 20 MP Live MOS Image Sensor and TruePic™ VII Image Processor work together to deliver the superior resolution professional street photographers demand. If you’re shooting landscapes or architecture, the 50 MP High Res Shot Mode combines eight images in one second to create a single super-high resolution shot. PEN-F boasts a 1/8000 mechanical shutter with the shortest release time of any compact system camera*, giving you blazing 10 fps sequential shooting to capture the spontaneity of the street. Street photography usually means that you or your camera is moving. That’s not a good thing if you want super sharp images. Olympus’ world-class in-body 5-Axis Image Stabilization System compensates for any type of camera movement so you can capture crisp, clear shots, even when light is scarce, or when the camera is susceptible to shake during telephoto shooting. PEN-F’s sophisticated image stabilization even works with older lenses that don’t have electrical contacts. Register up to ten profiles of non-data transmitting lenses in the camera for Exif inclusion. Build the system that’s right for you. PEN-F conquers all types of challenging shooting situations. Nighttime Live Composite Mode makes capturing dramatic images of brightly-lit city streets and star trails easy. You can even watch the composited images being assembled in Live View. Silent Mode quiets all camera noises - an ideal feature when you need to be discrete. Control the camera remotely from a smart device using PEN-F’s built-in Wi-Fi connectivity. And when you capture the perfect shot, the Olympus Image Share app lets you instantly upload images and video to share with friends and followers. If you can imagine a shot, Olympus has the ideal lens to capture it. The PEN-F is at the center of an extensive line-up of M.Zuiko Premium digital lenses, including a 12mm, 17mm, 25mm, 45mm, 60mm Macro, and a 75mm. Like the camera itself, these lenses are fast, compact, and built to exceedingly high standards. There’s also a wide variety of M.Zuiko PRO, standard, and body cap lenses available to match any shooting situation. "The vast range of in-camera image customization and wireless connectivity is a very compelling combination." Inspirational images from PEN-F users. Electronic first curtain shutter (Anti-shock mode) 1/320 – 60 sec. Expands Live View dynamic range. Fully articulated, mirror display in self portrait position. *Not compatible with Endless Memory..
*HDR function can be assigned to Fn-button. Can set the saturation level from -5～+5 for each of the 12 colors. Fourteen in-camera Art Filters are enhanced by new filter variations, art effects and bracketing. You can use Art Filters in all shooting modes as well as filming 1080 HD movies. With Photo Story, users can shoot a normal, everyday scene from multiple viewpoints and combine them into one image. Simply turning the mode dial to “Photo Story”, you’ll be provided with different formats to choose from, and everyday occurrences will become memorable scenes. Its beyond great, its a jewel! I bought a Pen F for a trip to SE Asia. I wanted something light and unobtrusive. I have been shooting an OMD EM1. The moment I picked it up there was a complete shift in my photographic thinking. I like the fact that the viewfinder is at the side, my nose no longer interferes with the screen when shooting. The camera is extremely customizable. I discovered that the 3 dials are an absolute boon to the photographer. I shoot in Aperture priority and have one dial set to F stop, one to ISO and of course there is the exposure compensation dial. I have complete exposure control with the three dials. This is a fantastic camera! I haven't pick up my OMD since I started using this little jewel. The menu is highly customizable. You can program custom button settings to easily set back button focusing, focus peaking and bracketing. Digging further into the menu and you can set up bracketing for exposure, white balance, iso, flash, focus and art filters. But the most unique feature is the Olympus Live composite - works great for night photography for capturing stars and for light painting. You will love light painting with the Pen-F! For vintage lens users, you can add your manual lens information so that the lens name, focal length and aperture is recorded in the EXIF. The focal length of the lens is automatically entered in the Image Stabilizer - one more step that you won't need to worry about as long as you have the correct lens profile selected. This camera is a work of art! Feels solid, well built and the perfect size for street photography. I have been shooting with Cannon and Nikon for better than 30 years before making the switch to Olympus. The photos the Pen F produces are amazing and has put the fun back into my photography! The Live Comp feature is so much fun and easy to use. I was able to get amazing results the first time I tried this feature. Good job Olympus.... I'm hooked. Pen F looks great and has lots of features. The image quality is outstanding, especially B&W which I love so much! Fantastic camera, excellent form and ergonomics especially with the accessory grip. Its very responsive, and of very high quality. I expect to keep the camera for many years, because its image quality is excellent. The creative options are nice too...its great to see the image in the field at the time of exposure instead of on the computer screen. Highly recommended! 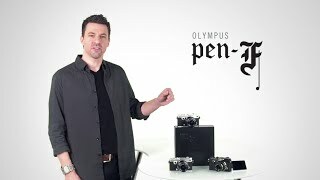 Need help with your PEN-F? We’re here to help. Superior resolution and razor-sharp. Start building your PEN-F System now. Now is the best time to build your kit! Add one of these popular M.Zuiko Lenses to your purchase for big bundle savings. Built for the highest level of performance in a variety of focal lengths. Add these custom add-ons and adapters to your order and do more with your PEN-F. *Please note that with your body only purchase, the PEN-F comes with a USB cable, shoulder strap, FL-LM3 flash, BLN-1 Li-ion battery and BCN-1 Li-ion battery charger. Add style and functionality to your camera with a wide selection of premium accessories to keep your gear safe. Add longevity to your system and protect your investment with an extended warranty. For additional coverage and benefits, check out the Olympus Pro Advantage Program.